I think that is the best word to describe my feelings when I discovered that my favorite rooster, let alone chicken, had not returned to the barn last week Wednesday. He was always one of the first of the chickens into the barn at the end of the day. Already it was dark and finding a black rooster in a wooded lot on a dark night was going to be an exercise in futility. I gave a heavy sigh and put out my wish to the universe that he still be alive and Mr. Muse and I nodded our heads in unison, after I mentioned my boy wasn’t in the barn, that Sumo the Sumatra was lost to the wilds. The next night found me searching the outdoor perches for Sumo in the dimming light as I approached the barn and not seeing him there I headed into the barn. I went about my routine of feeding the sheep and goats first and then grabbed my egg basket to collect what the hens had laid that day. As I stepped into their pen I saw a black object out of the corner of my eye and turned, surprised to find Sumo huddled up in the corner of the pen, his head tucked beneath a wing. I watched him and thought he didn’t appear to be breathing and touched his side. He jerked his head up, unbalanced and wobbly and that’s when I saw the blood smeared on the wall behind him. This wasn’t good at all. I collected the eggs and headed to the house, calling for Mr. Muse to, “bring me the gun,” explaining Sumo was in the barn but there was blood on the walls and if he was gravely injured I would put him down. Mr. Muse, gallant man that he is, fetched the gun and some ammo and asked if he should come with me as I grabbed a flashlight off of the shelf. I said that two pairs of eyes might be good as one of us had to hold Sumo up so he could be examined and we headed out to the barn. Gingerly, I picked up Sumo, who has been handled from the day he arrived at our house and didn’t make any fuss, and with flashlight in hand we looked for damage. Sumo’s big, black eyes blinked as he watched us and though there was a lot of blood, we couldn’t find any injuries more serious than blood feathers that had been yanked off or broken from his backside. Whatever he’d tussled with didn’t kill him, but did leave him hungry, dehydrated and exhausted. I’m not sure how long it took him to get back to the barn from wherever his fight happened on the property, but he was back. Mr. Muse and I swept into action, grabbing the cage top to an old guinea pig habitat that has become our go-to Medical cage for chickens, food and water dishes and the heat lamp. We examined him once again, grabbed a can of Blu-Kote and sprayed the bleeding feathers that were left, checked for broken bones, other injuries and gently I placed him in the cage under the lamp. Sumo is my buddy. He knows his name. He knows a couple commands (mostly because he’s highly food-motivated) and will fly up to my arm to perch parrot-like and will let me carry him around. While he’s still “a chicken”, I became attached to him when he was just a little guy and he’s definitely a pet. The next morning, I was greeted by Sumo who was standing up in his cage, had drank about half the water in his bowl and ate a good deal of food. He was much less shaky on his feet and his body temperature was back to normal. My patient appeared to be on the mend. Now, a week later, Sumo has become a spoiled rotten rooster, expecting a small offering of grain morning and night. Of course, the fact that I started that which puts his expectation square on me is beside the point. He’s still a bit wobbly but when he is walking around he’s much more sure of his steps. He’s going to be confined for at least another week to continue to regain his strength before being turned back in with the rest of the flock. Let’s hope that he stays away from whatever creature it was with which he went rounds. 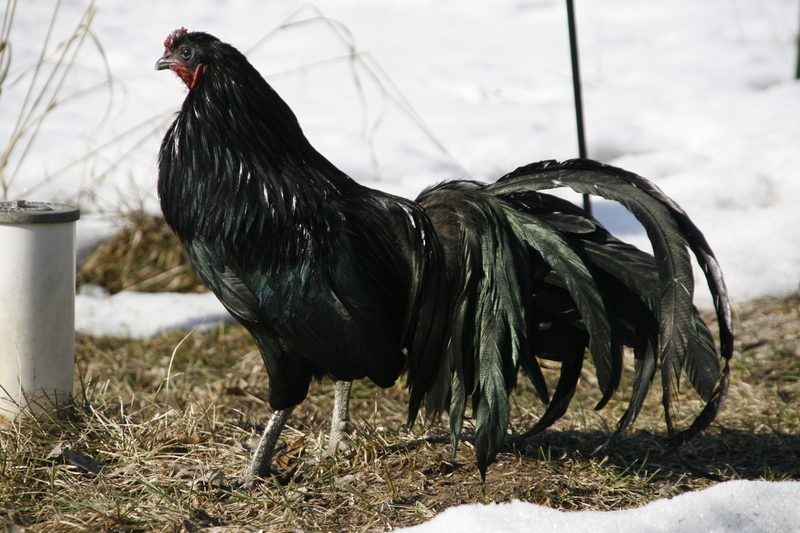 This entry was posted in Chickens, Fancy Coffee Friday, Musings, Personal, Random Thoughts and tagged blood feathers, Blu-Kote, crestfallen, Fancy Coffee Friday, rooster, Sumatra chickens. Bookmark the permalink. Oh, I’m so glad to hear he’s ok! That must have been scary — and I can’t imagine what he could have tussled with that would leave him that bedraggled, but mostly uninjured, but away for so long. I’m thinking he must’ve hidden and it just took awhile for him to feel secure enough to leave. When we brought Benji home, our 14 year-old-cat, Pip, made herself scarce. For weeks, I had the same weekday morning routine: I’d walk Benji, feed both dogs, workout, get the kids ready for school, see my wife & kids away, get myself ready for work, and then play with Pip, outside, for a few minutes. Lately, though, she hasn’t been around . . . I’m worried. Thanks, John. I hope your Pip returns soon. We can never underestimate the power of survival in humans and animals. Both however can benefit from the touch of the human hand and heart. First of all that photo is beautiful. Sumo is just so lucky to have you. I am so glad he made his way home….I have a feeling he know you would help. Thank you, Lisa. I’m very glad he made his way back, too. I call him “My Handsome Boy”, and he doesn’t seem to mind. Reading your story I began to tear up, ending with a big smile covered with tears. You know. Where is culminates in that one grunt laugh that blows a snot bubble out of a nostril. Awww, complete with a snot bubble? That’s the mark of a great blog post.